This October and November we are hitting the road again, this time with Big Daddy Wilson and his full Band from Europe! What a blast it will be and a step up to showcase his latest hot of the press released CD “Neckbone Stew”! The New Zealand Tour will feature 14 shows all over the country, starting on 14 October at the fabulous Nelson arts Festival and finishing up in Auckland on 04 November at the Tuning Fork. Check out the full schedule here, tickets for most shows are already available on eventfinder. The tour so far, there maybe updates and extra shows thrown in, keep watching out! New Big Daddy Wilson CD out now! Neckbone Stew! Yummy! Exciting news, yehaa! 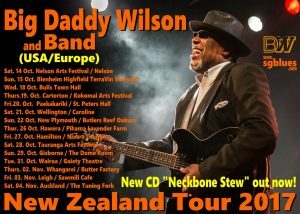 The new CD of Big Daddy Wilson is now out, a tasty boil up of all finest ingredients and the good stuff lying around on the music kitchen bench, it’s called “Neckbone Stew”! And we hope to get him back to New Zealand in the not too distant future…. fingers crossed! 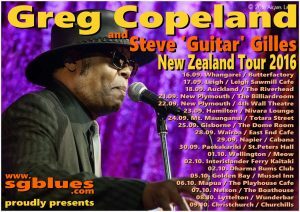 Greg Copeland and Steve ‘Guitar’ Gilles Tour coming this month to New Zealand! Greg Copeland and Steve ‘Guitar’ Gilles tour now on Bandsintown! Yehaa the upcoming much anticipated first New Zealand Tour of Greg Copeland is now on Bandsintown, with links to all the tickets, info and all that sweet stuff you neeed to konw to be there! Big News: Greg Copeland and Steve ‘Guitar’ Gilles New Zealand Tour 2016! Proudly announcing the Greg Copeland and Steve ‘Guitar’ Gilles New Zealand Tour 2016 in September and October 2016! Hold on to your hats, it’ll be a blast, be there! Acoustic Blues, Soul and Roots of the finest, delivered at 19 shows in 4 weeks from Whangarei to Christchurch! door sales available on the night unless booked out. Adding the final touches to the website! Working and beavering away on the website, I’m getting there! The beast will be launched soon! Keep your eyes and ears peeled…!